Moog brushless resolvers are economical and highly accurate. Motion feedback sensors can be used to provide velocity and position information for closed-loop electronic control, as well as brushless DC motor commutation. They contain no internal electronics or optics and are unaffected by electrical noise, heat, shock and vibration. We manufacture quality motion technology products for aerospace, military and commercial applications. 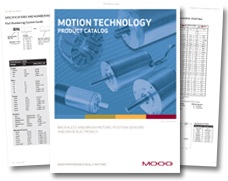 Click here to browse our Motor Catalog.